The rug is easy to clean and looks nice, but it's thin and doesn't feel great underfoot. It gets the job done, though. 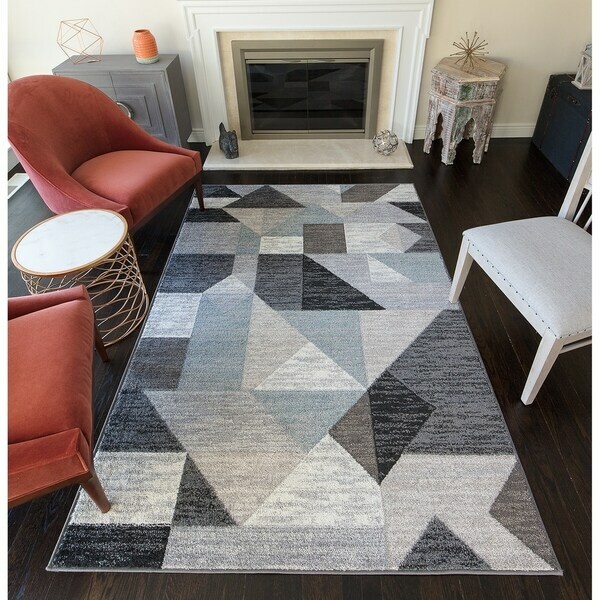 Metz Blue & Gray Mid-Century Geometric Area Rug - 5'3" x 7'3"
If mod is your go-to style then you'll definitely want to take note of the Deja area rug. This sturdy polypropylene piece features a balanced motif of geometric shapes in cool shades like slate, pearl, tan, and onyx. Engaging without being too busy, the design is reminiscent of a work of modern art. Power loomed with a frieze yarn pile; this accessory will let everyone know that you take your home's style very seriously. "Will this 8x10 rug be coming back in stock?"